Our donors get us to the highest courts so we can fight to protect the world's most endangered whales. Our supporters demand protections for our irreplaceable Great Lakes. And they fiercely call for a ban of pesticides that are killing bees and other pollinators so critical to the functioning of our ecosystems. 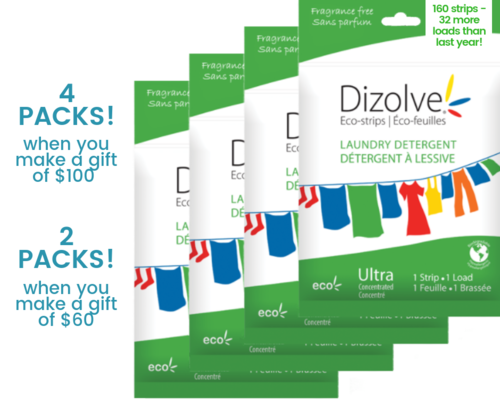 To celebrate your donation today, we will be sending you a generous package of Dizolve Laundry Eco-Strips. You can be a part of the growing movement to protect our precious planet. So, consider your laundry on us for the next while (folding and ironing not included.) We know there were quite a number of folks disappointed last year when we ran out of Dizolve, so we hope you participate today.